The Pyrenees is a range of mountains in the southwest of France that creates a natural border with Spain to the south. The range runs from the Bay of Biscay (Atlantic) in the west to the Mediterranean Sea in the east. It is France’s second great mountain range (after the Alps), with only a few peaks reaching over 3000 meters. The Pico de Aneto is the highest mountain at 3404 meters. 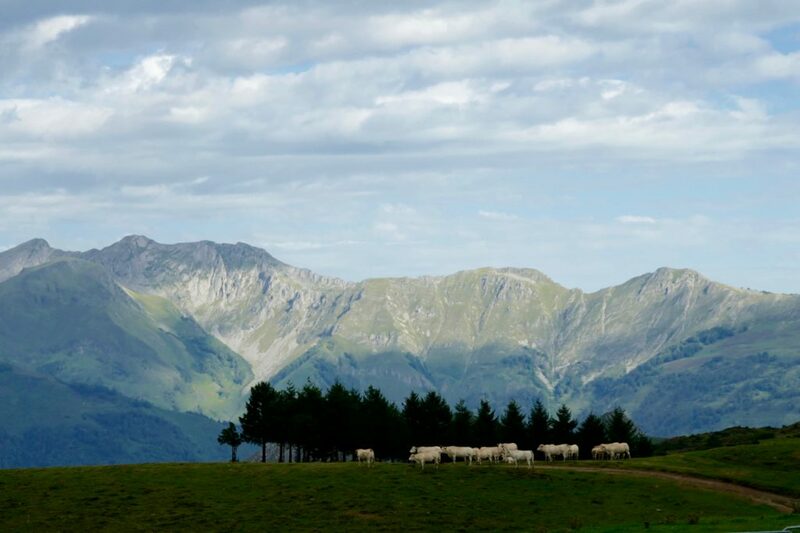 The Pyrenees can be divided into three distinct areas – Atlantic, Central and Mediterranean. The Atlantic Pyrenees is the Basque Country and is an area of low (but steep!) mountains, plenty of rainfall, and one of the most unique cultures in Europe. The Central Pyrenees (also called Haute Pyrénées) are where you find the highest mountains and is characterized by deep verdant valleys and towering peaks. The Eastern Pyrenees (Mediterranean) are lower again and become progressively dryer the nearer the range comes to the sea. The Pyrenees are less accessible than the Alps and have no major highways running through them. It is a much more rural region that its sister range, too, with much of the higher elevations dotted with horses, sheep and cows enjoying a free, fence-less area of pastureland all summer long. Cycling in the Pyrenees means climbing and some say that it is even more challenging than the French Alps. The Pyrenees also have a slightly longer Tour de France history, with the Col du Tourmalet (and other giants nearby) being climbed for the first time in 1910, one year before the Galibier in the Alps. And like the Alps, the Pyrenees offer many reminders of the Tour de France, such as Le Geant on top of the Tourmalet (which is ceremoniously transported to the pass each spring). But riding in these mountains means so much more than following the wheels of past champions. The roads here (like everywhere in France) are superb and there are countless smaller routes that have little or no traffic at all. The range is rural for the most part, but large towns dot the valleys and have an excellent choice of accommodation and restaurants. The best place to fly into is probably Toulouse, which will get you into the Central Pyrenees in less than 2 hours. Biarritz is a good entry point for the Atlantic Pyrenees and Perpignan on the Mediterranean side. Fast and efficient highways and and an excellent train system can get you to these places from larger cities in France quite painlessly. Like the Alps, summer is the time to ride in the Pyrenees. In general these mountains see a high amount of snowfall and it could be June before the high passes open (although many lower ones will be earlier, or even year round). Riding into autumn is definitely a possibility and a great alternative to the tourist season of summer. 44|5 Cycling Tours has one Pyrenees bike tour, which begins in the high Central Pyrenees and finishes in the resort town of St. Jean de Luz on the Bay of Biscay. Our HighRoad Pyrenees cycling tour is a week long and is fully supported and all inclusive. The Pyrenees is our most challenging HighRoad tour, with around 15,000 meters of climbing over the week. 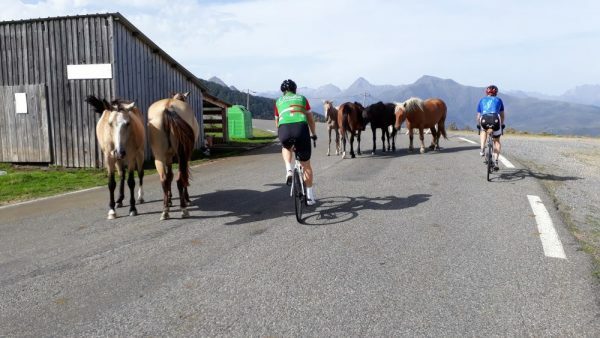 It is one of our few ‘Hors Catégorie‘ rated tours on our calendar and is designed for strong riders who have the endurance to ride multiple days on challenging routes. However, like all our HighRoad tours, the Pyrenees is not a race or ultra-endurance event, and there will be plenty of time each day to relax and explore your surroundings. Our hotel and restaurant selections are also top notch, so you will have only the best to refuel for the next day’s stage!